The Malaysian government is to set up a trust fund for people who have been attacked by elephants, tigers or wild boars. The "Wildlife Attack Victims Assistance Fund" will give up to 5,000 Malaysian ringgits (approximately US$1,316) to victims who were injured, and double that to the relatives of those who were killed. It was set up as a "token of the government's sympathy towards their plight" said Malaysia's Environment Minister Datuk Seri Law Hieng Ding. Attacks by wild animals on humans have risen in recent years, due to the loss of habitats and stricter wildlife protection laws, said the minister. Between 1998 and July 2002, 16 people died and 13 others were injured after being attacked by animals. While there are probably less than 500 tigers left in the wild in Malaysia, they account for over 50% of attacks by wild animals on humans. 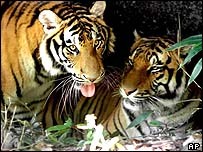 Tigers have been known to attack workers on rubber plantations, which are often established after clearing the animals' natural jungle habitat. Usually, the animals involved are too ill to hunt their normal prey.